The Kenya Miniwind project has now been running since September. 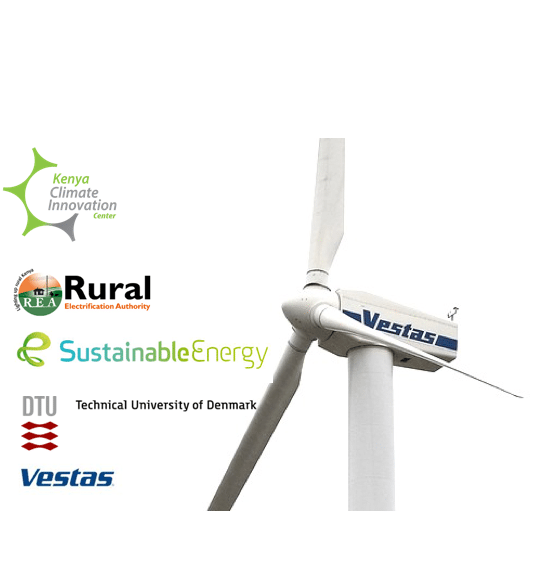 The project consists of SustainableEnergy, Vestas Wind Systems, Technical University of Denmark, Kenya Climate Innovation Center and Rural Electrification Authority in Kenya, all partnering together for a four-year project focusing on hybrid mini-grid development in rural Kenya in order to contribute to poverty reduction, stimulate economic growth and increase sustainable energy supply. To kick-off the project and establish the partnership further, all partners joined each other for a week’s mission in Nairobi in September. During this week, the project-team developed internal agreements and procedures and met with relevant stakeholders and government institutions. In the months that followed, the partners were focusing on the different project activities. One of the activities that are now in focus relates to developing a communication strategy of the project, thus, finding common grounds on how to go about the external communication in a multi-partnership project. From this work, a campaign directed towards the youth, debating the topics of climate change and private-public partnerships, will be developed. Another central focus of the coming months will be to select a site for the first hybrid mini-grid demonstration. Five sites will be chosen and the technical, social and economic feasibility of integrating a wind turbine into an existing smart solar-powered mini-grid will be examined. At the end of this process one of the five candidate sites will be selected and the first wind turbine erected later this year. This will mark the beginning of a longer test period of the feasibility of the turbine.